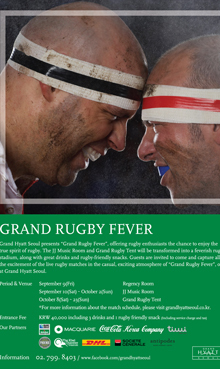 Grand Hyatt Seoul presents “Grand Rugby Fever”, offering rugby enthusiasts the chance to enjoy live broadcast matches of the 2011 Rugby World Cup, along with rugby-friendly drinks and snacks, in a stadium-style atmosphere. 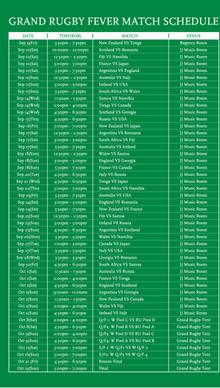 “Grand Rugby Fever” will be held from 9 September to 23 October at JJ Mahoney’s. Exclusively for this special event, the JJ Music Room and Grand Rugby Tent will be transformed into a high intensity stadium where participants can enjoy all the live excitement of the 2011 Rugby World Cup from New Zealand. Great drinks and various rugby-friendly snacks are guaranteed to enhance the experience. The Company’s subsidiaries manage, franchise, own and develop hotels and resorts under the Hyatt®, Park Hyatt®, Andaz®, Grand Hyatt®, Hyatt Regency®, Hyatt Place® and Hyatt Summerfield Suites® brand names and have locations on six continents.